Cucumber has so many health benefits. It has vitamin C and caffeic acid which helps irritated skin to soothe. It helps to reduce dark circles around eyes and give you a fresh and young look. Its use is especially good in summer because it has a high water content which keeps you hydrated and fresh. Regular use of cucumber slower down the signs of aging. 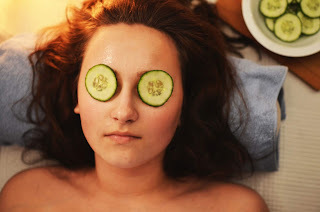 Silica in cucumber peel reduces sagging skin. It fades scares on a skin and works as a lightening agent. Cucumber is also good for digestion as it has a high level of fibre and water. If you eat a cucumber in the morning before breakfast, it will help to relieve constipation. It contains potassium which helps to lower blood pressure. It has vitamin B1, vitamin B5 and vitamin B7 which help in easing anxiety. Cucumber helps you to reduce sugar level. If you don't have enough time to mash and apply cucumber on the face, you can buy its serum and apply a few drops in morning and night. You can buy its face wash or cleanser.